I’m doing some spring-cleaning, so while it’s obviously the wrong time of the year for this, here is a nice idea for flipping the standard quiz format. Give the answers to the quiz and tell the students to come up with the question. I can’t remember where I stole these from, but they look like fun, particularly for Junior Cert students. It ticks lots of boxes; lateral thinking, group work where students work in pairs or small groups to argue over the correct question, etc. Alternatively students could be asked to come up with their own answers (and questions) for a topic. Anyway, we’ll try it next year and report back. What do two north poles or two south poles do when they are near each other? What does a magnetic compass do? How could you increase the strength of an electromagnet? Which way does a compass needle point when near a magnet? What happens when you break a magnet in half? Do you know what it’s like to be a student with learning difficulties? If you’re reading this as a teacher then the chances are that you were a good student in school. You probably did well in most of your exams and certainly well enough to get the required points to get to college and once there you managed to get your degree without too many repeat exams. It’s unlikely that you had or have any learning difficulties (not that many of the terms even existed way back then). Let me make a bolder assertion. You probably didn’t even hang around with the ‘slow learners’. They had their own friends and you had yours. You weren’t enemies or anything; just moved in different circles and followed different life-paths. Bottom line: you – like me – probably have no idea what it is to feel like a student who has a learning difficulty. What must it be like to have an attention span that’s almost zero? – to have organisational skills so poor that, with the best will in the world, you’re never going to be able to locate your homework in time for your teacher to acknowledge it? – to know that whether or not you work hard for an upcoming exam the result may well be failure either way? – to feel physically ill at the thought of upcoming end-of-year exams? Something to ponder as the Summer exams approach. As teachers we are very good at getting courses covered, and often that is (unfortunately) how students (and parents) judge us. 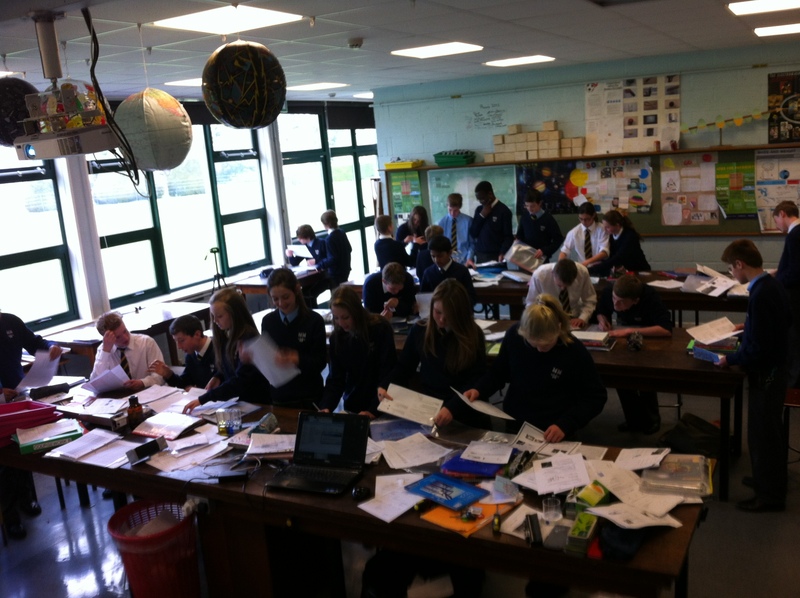 But revision is an essential part of a student’s learning and it’s one we often leave to the students themselves. This may be okay for the very good students, but for many others, particularly those with learning difficulties, it’s quite likely that they could do with a helping-hand coming down the home straight. This may well mean setting aside a class every week right from the very beginning of the year. It sounds radical but the exact amount of time spent and other details could vary from class to class and year to year. Most schools will have just three weeks of teaching left. If revision is one of those things you’ve been meaning to get around to but keep putting off until you get that next chapter finished, maybe it’s time to call a halt now. If so the following may prove useful. 1. Inform students what is and is not going to be on the exam, along with the time and structure of the exam (often it’s as important, if not more so, to inform the parents of students, particularly those with organisational issues, so they can help the students at home). 2. Make sure the students take down this information in their homework journals or similar (again, the students who need to take it down most are also the ones least likely to do so). Maybe parents should be asked to sign a form to acknowledge that they know what is on the exam. 3. If you use notes/handouts then provide students with a list of what they should have. The issuing of notes suits some subjects (like Science) more than others – are there alternatives where notes aren’t suitable? 4. Homework for students is to locate these notes and organise them such that they can be found readily when they are needed. this may necessitate seeking assistance from a parent, SNA or even another highly-organised classmate. online, say on the school website, where they could be downloaded by the student at home?). nightly revision to act as an incentive for the students. Students can correct each others’ work so it’s no extra workload for the teacher. 8. To give a further incentive, these totals could act as a percentage of the final Summer mark. It doesn’t have to be a large percentage, and if you have a set of 10 scores for each student you don’t need to add them all up on a calculator; just throw your eye over them and guess what the average would be. If it’s only a small percentage of their final mark then it’s no big deal if you’re out by a little. The idea is to encourage weak students to do a little each night. This is not an absolute template – different aspects will work to a greater or lesser extent with different subjects and teachers. But it is VERY important that we help these students, and as we all know, it’s the ones who are least organised who need help the most. A big problem with students who wish to do well in their exams is that they simply don’t know how much they have to know! It’s a perfectly understandable complaint, and hopefully this will help. All maths problems (see separate guide to answering maths problems). Graph questions (see separate guide to answering graph questions). Get your friend/Mom/Dad/brother/sister to ask you the exam questions from the questions at the end of each chapter in my notes – all the solutions are there to check with. When revising the Experiment questions don’t waste time writing them out fully. Sketch a quick diagram labelling all the main parts, and then write down one or two sentences summarising what you did. You can go into more detail in the exam itself – this is just to check whether or not you can remember the experiment. Get into the habit of marking/highlighting what you don’t understand, and then either ask a friend to explain it to you, or ask me. Make sure you don’t leave it and hope that it won’t come up in the exam! Most students who get A-grades in the Leaving Cert do this a lot. I don’t think it’s just a coincidence! Try to revise one chapter of science per night. BTW, this took time to put together so don’t be afraid to say thank you; you would be surprised how much a few small words could be appreciated (by all teachers, not just me!). With the Junior Cert Science exam just around the corner this resource will come too late for most, but for what it’s worth I am highlighting it here anyway. With over 45 experiments needing to be written up for Coursework A the sheer volume can be quite intimidating, particularly for those of us who are struggling with the subject in the first place. That’s why I’ve put together a very short summary of all the experiments on the revision page of thephysicsteacher. Each set (Physics, Chemistry and Biology) can fit onto one double-sided page (well almost – need to work on reducting Physics) and if students are looking for a more indepth description they can go to the original notes, which also contain every question which has ever appeared on an exam paper (at Higher and Ordinary level) along the accompanying solutions. Hope it’s of use to some of you out there. And remember – real Science bears little or no resemblance to the rubbish you have to learn for this exam, so try not to be put off by the subject.